It's time to let Chef Mic — aka your microwave — retire, y'all. 1. A color-coded, 15-piece knife set that'll teach you a thing or two about knives and how to use each blade. It'll also make you think twice about which knife to pick out before you try to use a bread knife to cut a chunk of ribeye. In addition to the seven specialty knives, this set also comes with six steak knives and a pair of scissors. 2. A set of versatile ramekins perfect for preparing a meal for one or an entire dinner party. Pop them in the oven or use them to serve condiments — it's up to you! This dainty, cute, and picturesque set won't disappoint. 3. 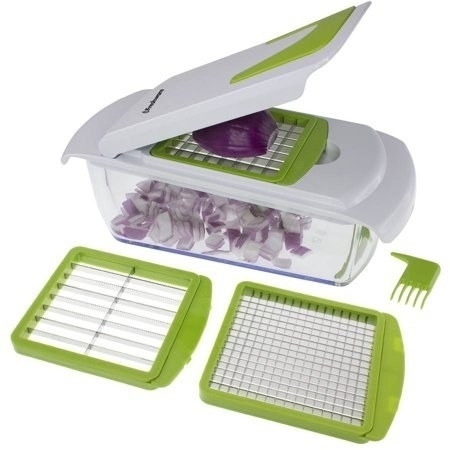 A two-tier steamer to give you a healthier cooking alternative. Plus, it's SO easy to use considering there's practically no cooking involved. 4. A chic marble cutting board that'll inspire you to chop everything in sight, then take a picture of your masterpiece and share it with the world. 5. A thick ergo-foam mat to give you the support your feet, legs, and back need when you're washing a mountainous pile of dishes. 6. A KitchenAid mixer that comes in a shocking array of 40 color choices. Yes, 40! Each color will add a dose of personality to your kitchen. I don't bake often but with this baby, you can catch me on next season's The Great British Bake Off. This mixer also has 10 speed settings and a tilt-head design to tackle any recipe. This set comes with three interchangeable heads: a flat beater, dough hook, and wire whip. These accessories are top-shelf dishwasher-safe and the 5-qt. stainless steel bowl is bottom-shelf dishwasher-safe. 7. And! A KitchenAid pasta roller and cutter extension set so you can have lots of fun making the BEST noodles you've ever had in your life. Whoever said you can't play with your food definitely kneads this. This is attachment set does not come with the actual KitchenAid stand mixer (but you can get one here!). It includes three interchangeable heads: a pasta roller, fettuccine cutter, and spaghetti cutter. It also comes with a brush for cleaning and dusting since it's too delicate for the dishwasher. 8. A life-changing air fryer to turn bland potatoes into yummy, crispy fries with just a fraction of the oil you'd typically use. It's truly a brilliant product. 9. A set of gorgeous mini slow cookers with three temperature settings for you to show off at your next dinner party. For instance, you can use one to heat up soup and the other one to keep fondue warm! Really — from appetizers to desserts to one-person meals, this dynamic duo has you covered. 10. 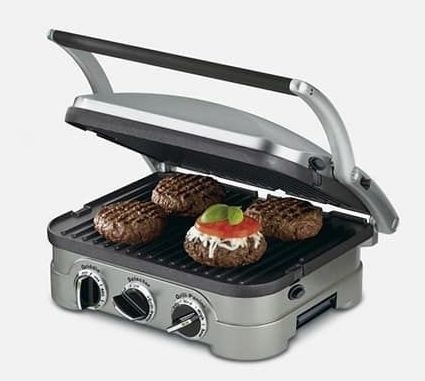 A multi-functional griddle to cook...basically anything! Sausages and eggs? Check. Grilled cheese? Check. Burgers? Check. 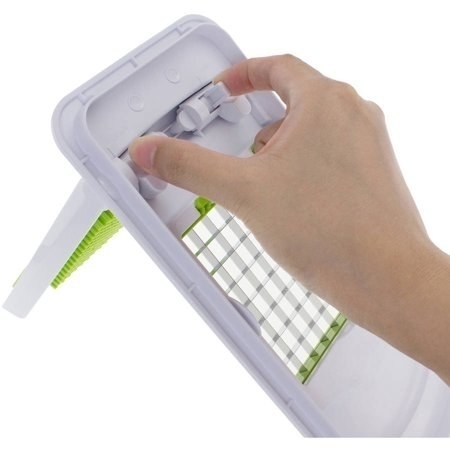 Its removable plates make it so easy to clean, you won't even break a sweat. 11. A 16-piece Drew Barrymore dinnerware set so elegant, you'll want to use it every chance that you get. Even the plainest bagel will look like a delicacy with this set. This set comes with four dinner plates, four salad plates, four bowls, and four small bowls — all microwave- and dishwasher-safe! This bundle includes an emoji timer, 10-piece measuring spoon and cup set, 2-piece 12" silicone spatula set, a whisk, 2-piece tongs set, and a 3-piece strainer set. 13. A gold speckled 12-piece cookware set to equip you with the essentials for whipping up magically delightful meals. This set comes with a 6-quart Dutch oven with a glass lid, 3.5-quart sauté pan with a glass lid, 2.5-quart saucepan with a glass lid, 10-inch frying pan, 8-inch frying pan, and four cookware protectors. 14. A set of Pyrex glass trays so you can see each and every layer of your lasagna or casserole. With this, you can bake, serve, and store — all in one. These baking dishes come in three sizes and with storage lids (dishwasher-safe on top rack only). 15. 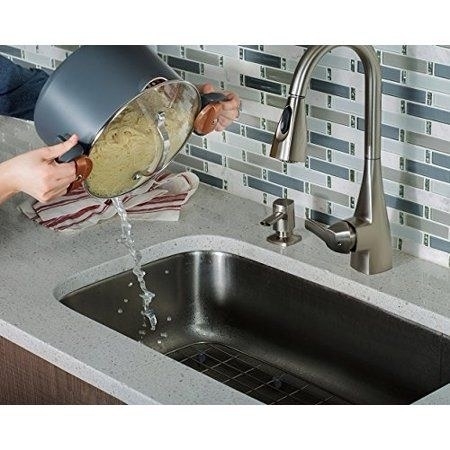 A handy pot with a built-in strainer to effortlessly dump out water and get on with your day. Plus, this has a scratch-resistant surface so you can safely mash potatoes after boiling and straining them. 16. A pair of electric salt and pepper grinders that'll for sure wow your house guests. If having seasonings at the push of a button doesn't scream 21st century, then I don't know what does. This grinder set requires six AAA batteries, which are not included. You can get a 16-pack of AAA batteries for $11.78. 17. An easy-to-clean and durable cast iron pan to evenly grill anything from tender chicken to juicy steak. It comes pre-seasoned, meaning you can start cooking once you open the box because we all know it's the package you've been waiting for. 18. A necessary 10-piece utensil set that just seems too good to be true, doesn't it? It literally has every type of utensil you'd ever need, and as a bonus, the ashy blue color is just breathtaking! This set includes: a solid turner, wide-slotted turner, slotted turner, regular turner, solid spoon, slotted spoon, spatula, soup ladle, skimmer, and spaghetti spoon. 19. A four-in-one chopper and slicer so you can dice fruits and veggies like an actual Fruit Ninja. Just one push and you get a handful of evenly sized pieces. This also comes with a storage lid to conveniently chop, cover, and store! 20. 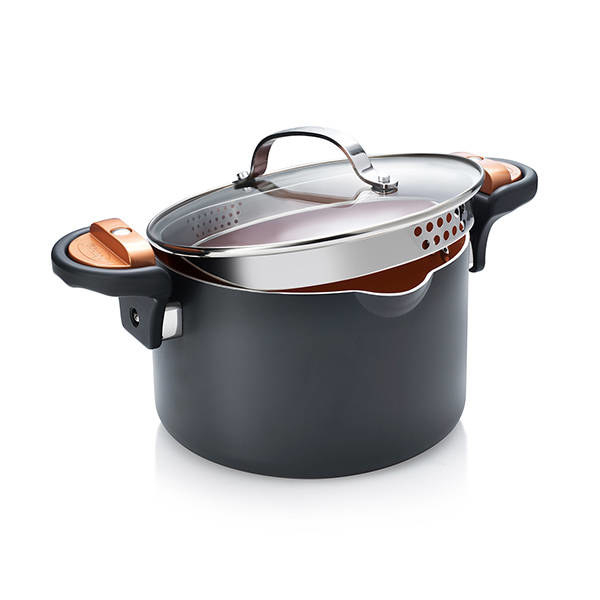 A stunning cast iron Dutch oven to slow cook your favorite stew and enhance its flavor. Double this as a serving dish since its awesome heat retention will make sure your dinner stays nice and steamy. It has a porcelain enamel interior finish and an exterior porcelain enamel finish that are both durable and scratch-resistant. It's oven-safe up to 400°F degrees and compatible with gas, electric, ceramic, and induction cooktops. Plus, since it's made of cast iron, it ensures even heating and excellent heat retention. 21. A salad spinner that'll dry your salad in no time. Take it for a spin, you won't regret it!